A Visual And Interactive Orientation To The Battle Of Gettysburg! Touring the Gettysburg Heritage Center Museum, guests will witness the Battle of Gettysburg from two unique perspectives – the civilians who lived in the town of Gettysburg, and the soldiers on the battlefield. Take a step back in time to see the reality of war, and hear the stories of the people who called Gettysburg home. This story is told through 3-D photographs and programs, artifacts, interactive displays, and story boards. The second part of the tour is a 20-minute movie presentation that offers a great orientation to the Battle of Gettysburg. The award-winning movie, “Gettysburg: An Animated Map,” is presented by the Civil War Trust. The Gettysburg Heritage Center museum is the perfect place to begin your tour of the Gettysburg Battlefield! 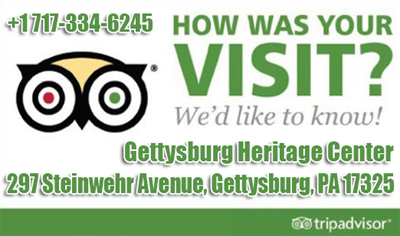 The friendly and knowledgeable staff of the Gettysburg Heritage Center can help you plan your tour of the battlefield. There are a variety of ways to learn about the battle; from bus tours, to horse & carriage, iPads, and more! Every tour is different! ​Let us help you plan your visit! Don't miss our great gift shop! ​Located in the lobby of the Gettysburg Heritage Center is one of Gettysburg’s largest and finest gift shops! Specializing in Civil War books, apparel, replica weapons, home décor, souvenirs, games & toys, collectibles and much more! Offering a wide selection, and distinctive gifts! **Hours subject to change - call for exact times. *Last time to enter the exhibit area is 1 hour prior to closing. New Years Day: Limited hours, call or check back for times.